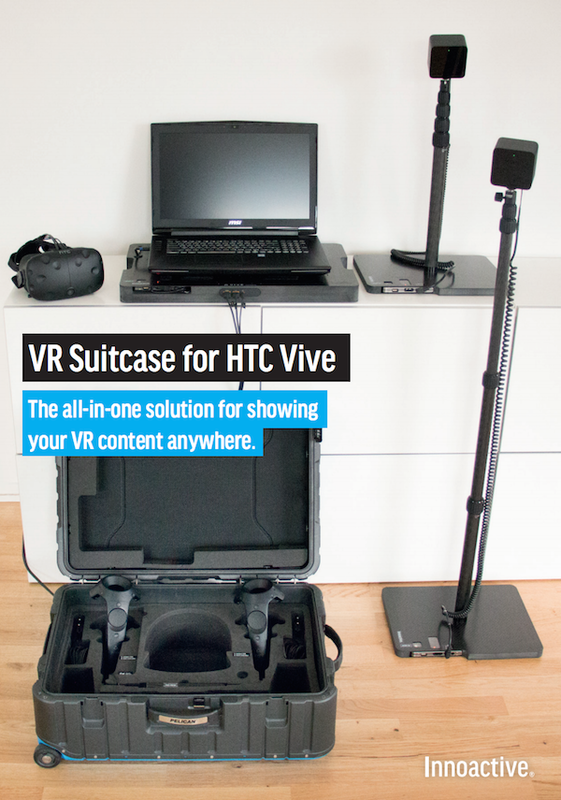 VR gaming PCs are going to come in all shapes and sizes eventually, but a Munich-based company is already stepping up, showing off a VR suitcase which packs an HTC Vive headset, and a gaming PC to run it. 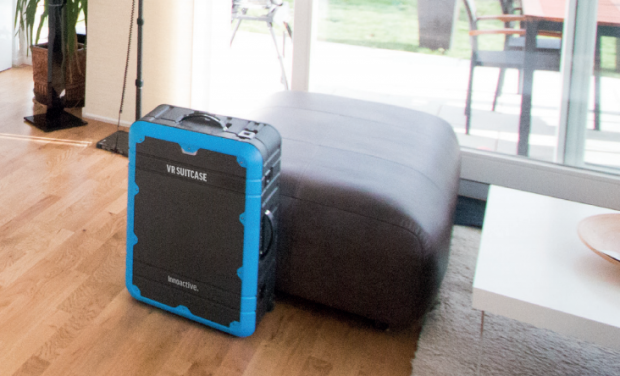 The suitcase has everything you'll need for an unpack-and-deploy VR gaming experience, including a gaming laptop and batteries, getting the VR set up in less than five minutes. 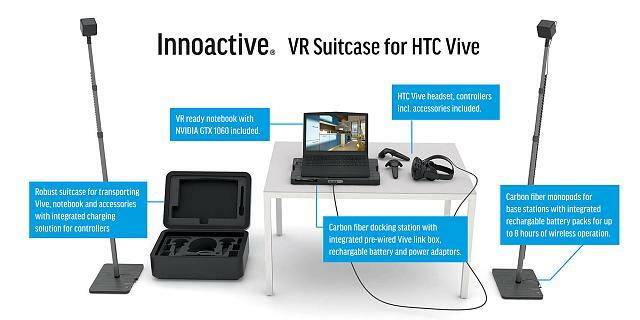 The Innoactive VR suircase packs a VR-ready notebook powered by NVIDIA's new GeForce GTX 1060, a carbon fiber docking station with an integrated pre-wired Vive link box, rechargeable battery and power adapters, the HTC Vive headset, controllers, and carbon fiber monopods for the base stations with integrated rechargeable battery packs for up to 8 hours of wireless operation. As you can see, Innoactive has thought of everything. The VR-ready gaming PC is MSI's GT72R, powered by an Intel Core i7 processor, 16GB of RAM, 256GB SSD, 1TB HDD, and the GeForce GTX 1060. It's not cheap, with each VR suitcase costing around $9400, plus applicable taxes and shipping. Now this is a great idea for portable work. I would like to see this setup used for libraries, schools (this could be the new TV cart! Who didn't love those? ), and hospitals (I think there is plenty of VR therapy for mental illness possibilities - working on a blog about it). I love it, I think the only down side is the price, but it has everything you need, so if you are a regular guy who wants to upgrade your setup to make VR, just sell everything related to this and leave that as your main computer and it won't be that expensive. The pricing would make this a choice for business/industrial needs. Don't think this would be consumer. Yeah, this would be great for taking out to conferences and game expos. Right now transporting the whole setup for VR is a pain, especially if you are flying anywhere. I kinda thought that after I posted, I might add I'm not a big fan of using laptops as workstations especially for something as power hungry as VR, I'm more inclined to think in the long run users are going to have replace a laptop or laptop motherboard but of course that's easer to do with a mini or mid tower, I got this gut feeling that over time laptops are going to break down with this kind of demand on the system especially due to cooling issues that towers naturally address better. Hey Russell, this should be the next VR Heads prize! Heads up! : Nvidia driver update got messy with HTC Vive plugged in.